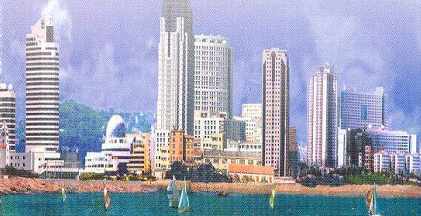 The home of BOSTD Geosynthetics Qingdao Ltd.
Modern Hotels and office blocks blending with the older traditional parts of Qingdao. A modern resort city on the Bohai Sea with first rate sea, air, road and rail connections throughout China. China’s second largest container port with ship repair yards. Venue for the water sports during the 2008 Olympic Games hosted by Beijing. Wusi Square with the City Government Buildings in the background and the Qingdao Monument in the foreground.